Fireball Sports offers a bewildering array of golf teaching and training aids for sale on our online golf store. Our range, which is carefully selected from hundreds of available devices on the market for sale, works to resolve common faults found in this most difficult game that is golf. We have tried to steer away from the crackpot inventions which mystify the mind and bamboozle even the most dexterous sportsmen and women who try to put them on. We endeavour to ensure that each device does what it says it does and as golfers ourselves, have proved the efficacy of each item to our satisfaction. Further, many of the products in our range carry explicit endorsements from giants of the game such as Nick Faldo and Gary Player. So to help you find your way to the item which is going to knock shots off your handicap, we have written this brief piece to help you identify the shortcomings of your game and link them with golf teaching and training aids that will assist you in remedying each fault. Enjoy the read and get ready to see your scores come tumbling down! Most golfers, naturally hit their ball with either hook spin or slice spin. Colin Montgomery for example has a natural fade which is a mind form of the slice. A ?Hook? shot is where the shot curves violently from right to left (assuming a right handed golfer). A slice is the opposite of a hook where the ball curves from left to right. Correct analysis of your swing is vitally important in ascertaining the measures required to correct these faults. The best place to get such analysis is with your local PGA professional. A visit for a lesson will provide you with the fundamental knowledge required to show you how to work on your faults. He or she will also be able to make certain that your golf equipment is suited to your individual swing. One of the most common causes of a hook shot is an incorrect grip. The grips themselves should be in good condition and not smooth and shiny. You should also check with you local PGA professional that the grips are the correct size for you. The Easy Grip slides onto your existing grip, easy to use and fits any club. Suitable for both left and right handed players. Can be used to practice any style of grip (i.e. Vardon, interlocking, baseball) Justin Rose says, ?Easy Grip helps me maintain a perfect and consistent golf grip for all types of shots. I am sure it can help you do the same?. The pre-formed training grip is an essential learning aid especially for new golfers. These pre-formed grips make it easy for the beginner to pick up the golf club right the first time. We have grips to fit men, ladies and juniors. Also check out the new David Leadbetter training grips that have taken the pre-formed training grips to the next level. Other causes of the hook shot are poor body alignment and ball position, improper weight transfer and or swing plane, and also over use or rotation of the hands through impact. The Set UP Alignment Board is perfect for learning foot placement and ball position, flip it over and you can check your swing path and clubface position. This part of the golfing game probably has more teaching and training aids designed for it than any other part of the game. It?s no good being able to drive the ball 300 yards in a straight line if you can?t putt it the last 10 feet. On average, 45% of all shots are taken with the putter. Because of the importance of this part of the game, Fireball Sports takes great care in choosing the most beneficial golf putting aids and products to help you improve your technique. Look out for new products being added to this section continually. With putting, it is vital to practice and it doesn?t have to be done at the golf course. It can be done almost anywhere. A common technical mistake that many golfers make is to use the same length of stroke for all putts, de-accelerating on the short ones and accelerating on longer ones. The Putter Bubble will help to hit the ball on line every time. A great product for learning to hit the exact centre of the ball. Hit it incorrectly and the ball will go off line. The Sweet Spot Putting Clips come in a set of 3 progressively smaller clips which are used to increase the player?s feedback on off-centre putts. Miss-hit shots will shoot erratically to the side, while centred strikes will be rewarded with a true roll down the target line. The No 3 Putt makes the hole look huge. Practice for just 5 minutes a week and make that hole look the size of a 10 gallon bucket. The Pin Balls are designed to teach the player how to square the putter at impact; these challenging shiny balls are quite difficult to roll true. Because of the way the balls are made, you need to strike them with a square putter face to get them to roll true, if not they will spin round. The Putting Connection has a universal appeal as it has been designed to fit all players, is easy to use, and works. Keeps the arms locked during the putting stroke. The Mentor Putting Mirror is a good introduction into the basics of putting. The Mentor Mirror ensures correct alignment to the target. 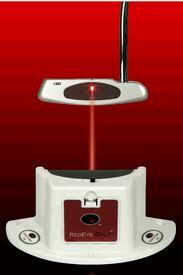 Perfects eye alignment and allows the player to monitor the stroke path. Checkerballs instantly let the golfer know whether the ball was hit correctly, or if the club face was open or closed at impact. Comes in a pack of 3 balls each differing in ease of use. Shanking is where the golf club hits the ball at the point where the hosel of the head meets the club face. Probably one of the most frightening bad shots in golf. There are several causes as to why this can happen, either the arms tend to drift away from the body during the downswing or your whole body weight could be moving slightly towards the toes. Also, a severe out to in swing path will cause a shank and will usually result in a sliced shot. The Spine Aligner which goes around your back and arms will help promote an ?arms in front? swing, stopping the arms from drifting away. Comfortable to wear for both men and women. How frustrating to miss the green by just a few feet with an approach shot and then take three of four more shots to hole out. The cause for this is quite often incorrect club selection and poor technique. It is all too tempting to use a lofted club such as a pitching wedge or even a lob wedge. If you have a clear view of the flag, it is best to use either a 6 or 7 iron and use the same technique you would for putting. Hold the grip right down at the bottom almost onto the shaft, use your putting grip and make sure your eyes are directly above the ball. The club may appear to be far too flat in this position but will not effect the outcome of the shot. To play the shot, use a pendulum stroke, with very little wrist action, brushing the ball off the grass. The Chip n Pitch is a lightweight extension that attaches to your own club, and hits against your lead side if your hands break down. The Figure 8 Strap a simple elastic armband that restricts the arms from separating and encourages a smooth connected swinging motion. Available in medium and ?X? large. The Wrist Firm teaches you to keep the back of your leading wrist firm throughout the swing. Wrist Firm will help totally eliminate the deadly cupped wrist position at impact, the scooped shot around the greens and the flipping of the wrists when playing shots from the fairway.